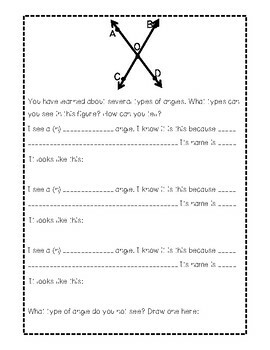 This is a discovery lab for middle school students as they begin their study of angles! The discovery method of learning provides students a way to work with the math and think about the concepts before learning the technical terms and rules of angle relations. I have designed this lab to start at the basics of naming angles (what I call "math grammar"! 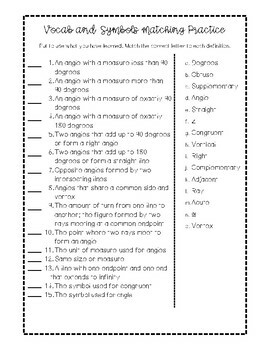 ), then proceed through discovering angle relations, ending with formal vocabulary matching practice. Topics discovered include naming angles, types of angles, vertical angles, adjacent angles, complementary angles, supplementary angles. 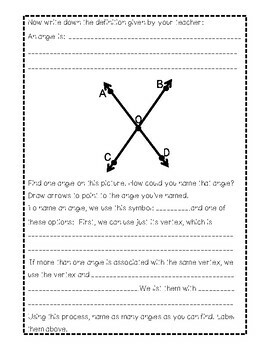 I designed this with 7th grade curriculum in mind, but it could also be used in 8th grade to review angle relationships before learning about parallel lines cut by a transversal!